The first Sunday of every month, Downtown Eau Claire Inc. has its own section in the Leader Telegram! Make sure to check it out for updates on events, businesses, and what's happening in the entire downtown area. 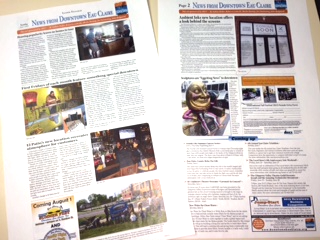 The first page of "News from Downtown Eau Claire" (shown on the left) is inserted into the Leader Telegram. Look for the complete paper, including the second page (shown on the right) at Downtown businesses and local grocery stores.